Craig is 18 years old. He has a profound learning disability, motor and sensory skill problems, cortical visual impairment and symptomatic epilepsy. He is mostly wheelchair bound and requires 24 hour support for all aspects of his personal care and basic needs. Craig has limited ability to make choices. 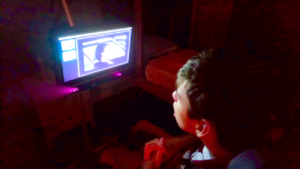 In his final year at school, Craig began a period of assessment using the EyeGaze device with specialised software. Using his eyes to control this device, Craig was able to participate in a number of activities and he demonstrated his understanding of cause and effect. Now he has left school, his parents and care manager felt that if Craig had permanent access to an EyeGaze, he would further develop his ability to interact with his support workers – it would give him a “voice”, enabling him to communicate his own choices and desires, make himself understood and help him engage in stimulating learning activities. Craig was awarded a grant to fund the EyeGaze system. Craig’s father sent us these pictures and video (above) of Craig and he told us “Craig enjoys clicking on the cells with Kylie Minogue, the Red Hot Chilli Peppers and The Simpsons, which we often encourage at the end of a session. He is also working on the car programme where he likes putting the wheels on the car, and we are working on other parts. 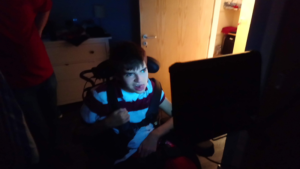 Craig uses his EyeGaze in his room where it is nice and dark, we find it works best in a darkened room. As you can see by the smile on Craig’s face, he loves his EyeGaze. Thanks very much for your kind donation which is giving Craig the ability to make choices. We never thought it would be possible for Craig to get so much interaction and even learning from a fantastic piece of kit”.